My mom found the crown at a pet store, it was originally meant for large dogs! It has elastic that fit around his chin. At our barn's annual Halloween party! 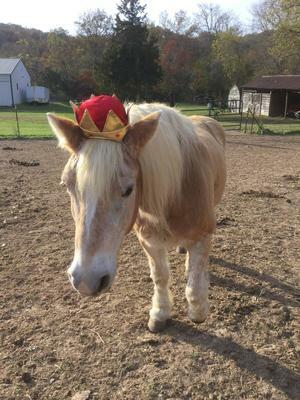 Everyone was so glad to see Billy (aged 26) hale and hearty and in his royal finery. He had a bad sinus infection last year that required two hospitalizations and two tooth extractions, so we were all thrilled to celebrate his full recovery! He didn't mind wearing it at all! He knows he's the prince of my heart! Comments for Bonny Prince Billy! It's SO cute! He looks similar to my horse who is two years older. He looks like such a sweet horse. I am so glad he's doing better. Thanks for entering. Return to Share Your Best Halloween Horse Costumes 2017.